Somdej Pra Sangkarat Wat Suttat was borned during the King Rama 4 Period. He was borned on 12th November BE2399. His father was named Nut and his mother; Oon. They were farmers at Bahng Lunpoo Lahng (old name for a place in Tonburee). 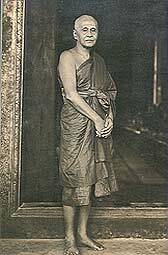 When he was 13 years old, his father bought him to become a novice under Pra Somdej Wan Rat (Somboon) of Wat Raat Boorana. During his novice days, he also learn dhamma from Ah Jahn Poh at Wat Torng Noppakun. In BE2422, when Pra Somdej Wan Rat (Somboon) passed away of illness, Somdej Pra Sangkarat (Pae) went to be ordained under Pra Somdej Wan Rat (Daeng). Later on, he also learned Dhamma from Pra Sangkarat (Sah) at Wat Raai Pradit. - BE 2419, Went for Dhamma exam at King's Palace. However, he did not managed to pass. - BE 2425, Passed the Dhamma exam and promoted to Preai 4 (Rank). - BE 2428, Passed another Dhamma exam at Wat Pra Seeratanahsasahdahrahm (Wat Pra Keow) and promoted to Preai 5.